Roccat announced its Kulo Virtual 7.1 USB Gaming Headset will hit the market in May 2011 for 79.99EUR. I am happy to let you know that ROCCAT™ presents the Kulo Virtual 7.1 USB Gaming Headset, the second version of the Kulo Stereo Gaming Headset, featuring a 7.1 USB sound card. The ultra-lightweight Kulo headset features super-soft on-ear padding and the Automatic Mic-Mute function, and delivers thrilling surround sound with separately adjustable levels when used in conjunction with the 7.1 USB sound card. You hear footsteps behind you to the left, a rustle, shouts – you’ll hear the enemy before you see him. The 7.1 USB sound card comes in really handy even with notebooks that only offer mediocre sound quality. In addition, when a speaker system is connected in parallel there’s no need to go through the hassle of plugging and unplugging cables – plus the headset delivers the same premium sound quality regardless of which computer the headset is plugged in to. 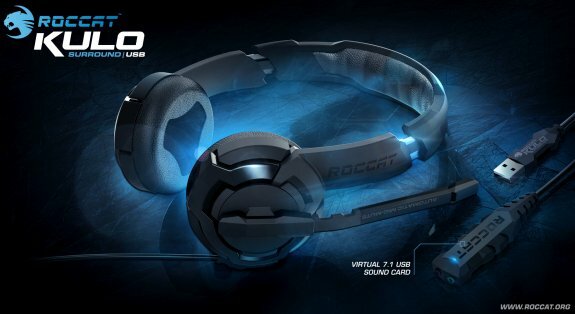 The ROCCAT™ Kulo Virtual 7.1 USB Gaming Headset will be available from the start of May 2011 for the MSRP of €79.99.